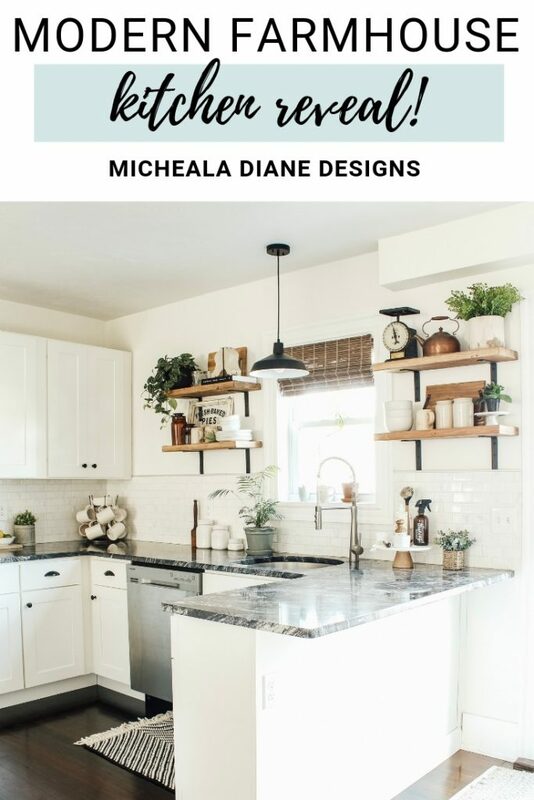 Our kitchen got a budget friendly makeover with a modern farmhouse style. Come see how small changes can make a huge impact. I’m so excited for today’s post. 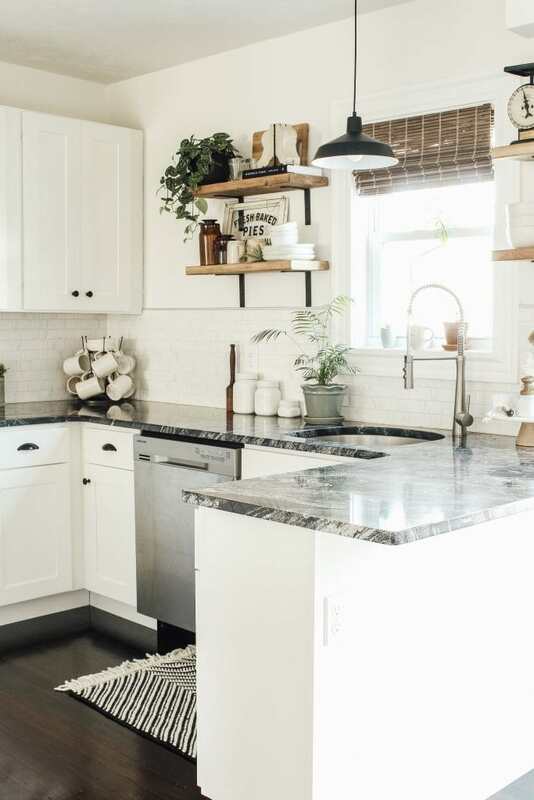 It has been so fun taking you along on our kitchen makeover journey and today is the final reveal! Our before wasn’t much to complain about. It was beautifully updated when we bought our house, but it just wasn’t my style. There were however a couple of major existing design elements that fit perfect into the modern farmhouse look. 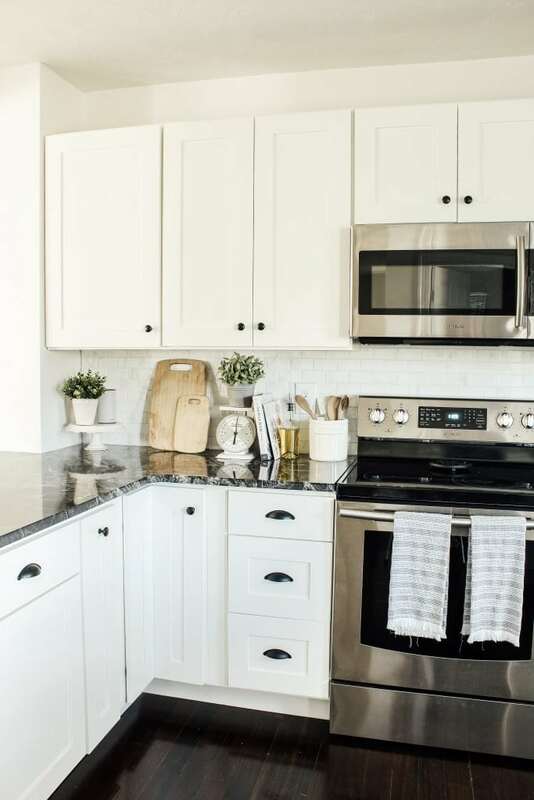 The white cabinets and the subway tile back splash, both of these I absolutely love and made it easy to update a few things to get the look I am going for. 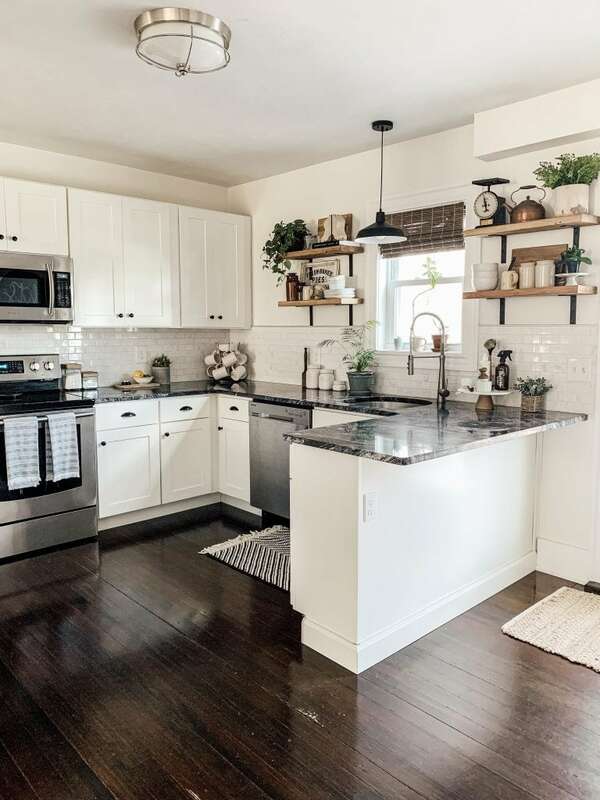 Ok friends lets get to the fun part, grab a cup of coffee and welcome to a tour of our beautiful modern farmhouse kitchen! The first big change we made was to paint the kitchen white. The existing color was a sea salt green and I didn’t like the way it looked with the black counter tops. The white has brightened up the space so much and gives that modern farmhouse vibe. 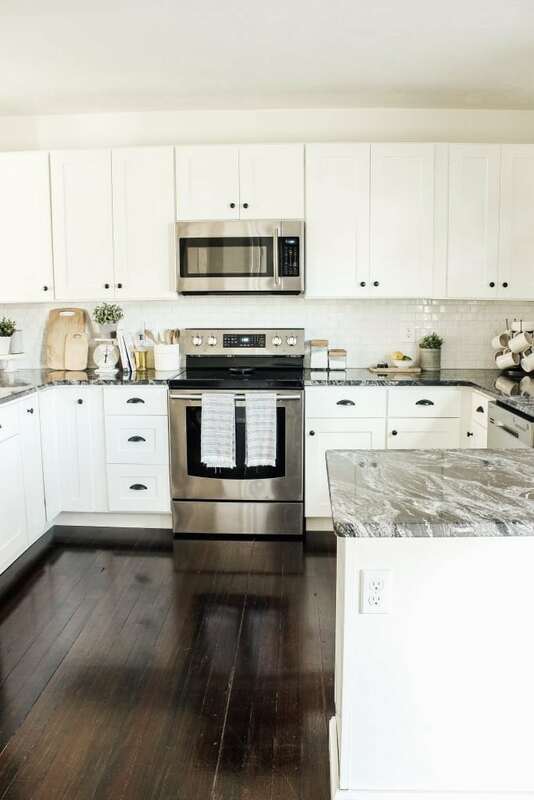 We chose Benjamin Moore White Cloud and it works perfectly with our white cabinets. It is a soft warm white, but not so warm that the bright white cabinets make it look yellow. The next big change we made was updating the hardware. We switched out our existing glass knobs and silver pulls for matte black ones. 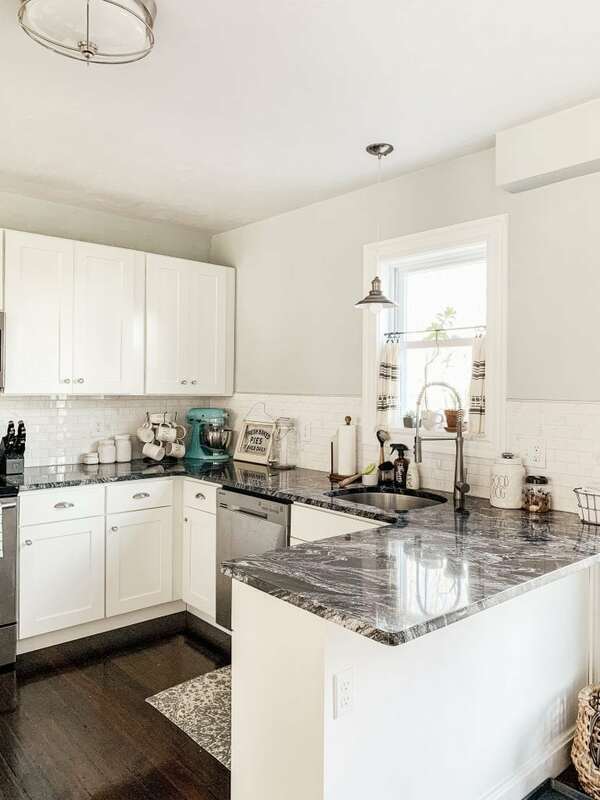 They add a beautiful contrast against the white cabinets and pair well with the black granite counter tops. We purchased the matte black cabinet knobs new and spray painted our existing pulls with my favorite spray paint, All Surface Flat Black Spray Paint and Primer in One. One tip I have for any makeover project, especially when you are on a budget is to sell the items you are replacing. We were able to sell our existing glass knobs on Facebook Marketplace and made enough to buy our new black knobs. Between spray painting our existing pulls and selling our glass knobs this was basically a free upgrade. We replaced the pendant over the sink with this barn-style pendant light. 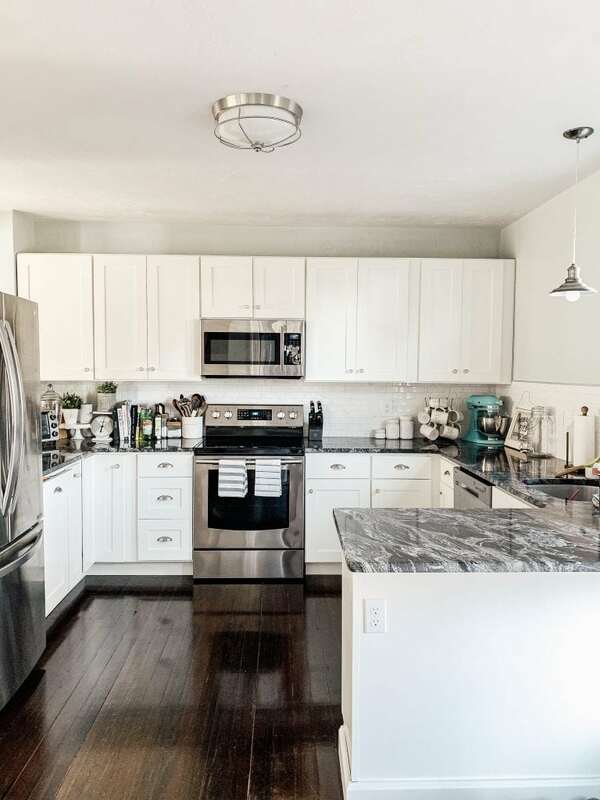 It is also a matte back finish and ties in with both the hardware and the counter tops. 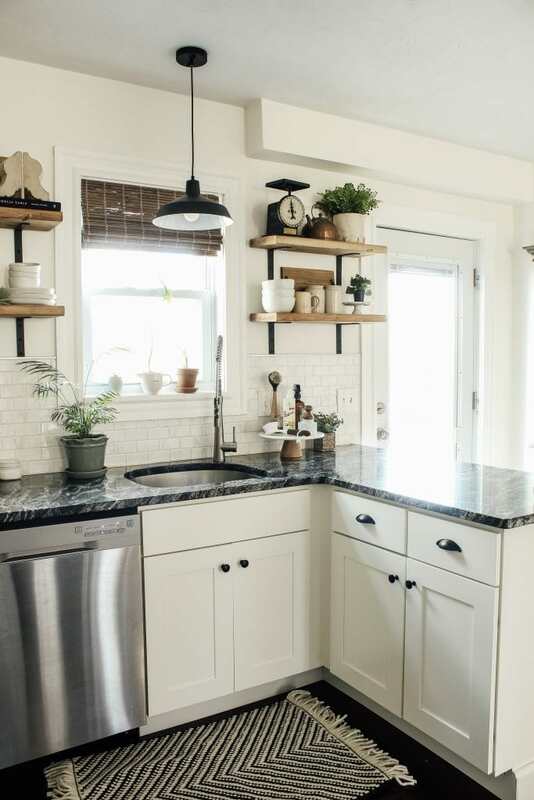 This pendant style comes in a variety of sizes and some can be too big for over the sink. The first one we ordered was way too big, luckily I was able to return it and found this one and it fits perfectly! 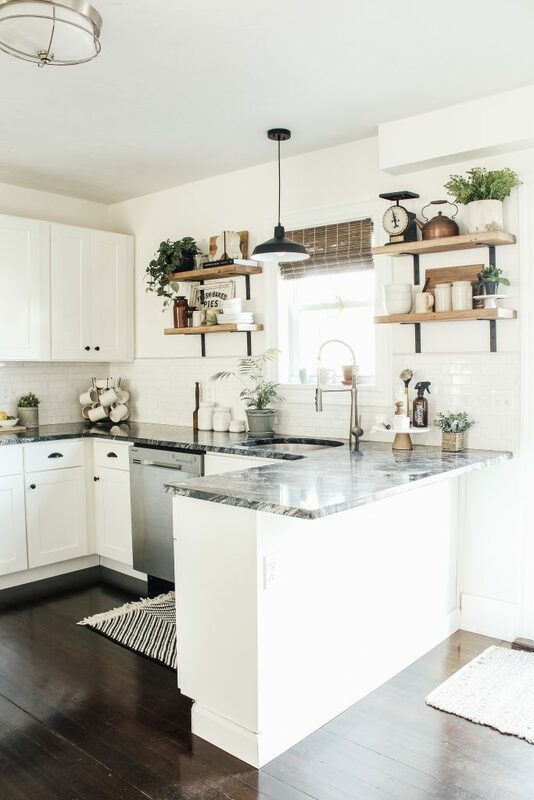 Our big DIY for this kitchen makeover was the addition of open shelving. I have to say I am in LOVE. We have been envisioning open shelving since we moved in and we are so excited to have it completed. 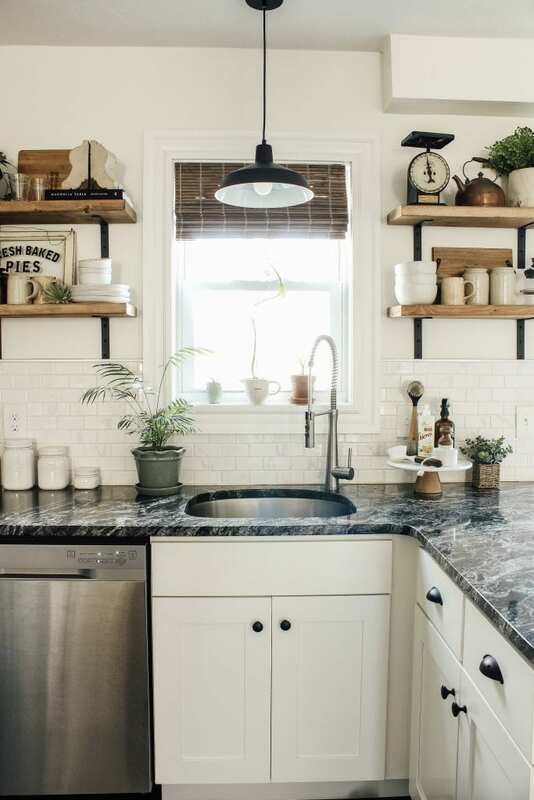 It makes the kitchen feel more cozy and allows for functional and decorative storage. This was an easy DIY and I have a complete guide on how to add them to your own home here. 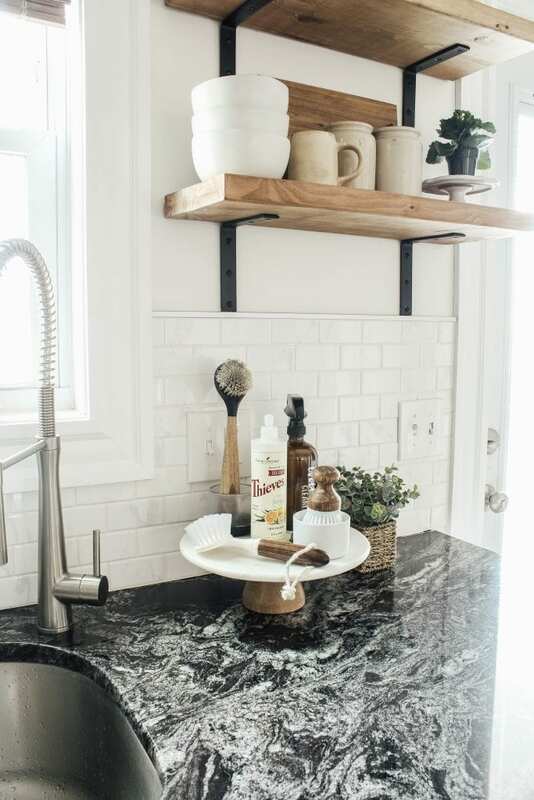 I also have a great post on how to style open shelving that you can find here. We added a new shade for our kitchen window. I chose this bamboo shade because it added a nice warm wood element against all of the white and black. It also adds texture to the space and I love how it looks against the white walls. Another item we switched out was our old rug in front of the sink. We replaced it with this new black and white chevron one. 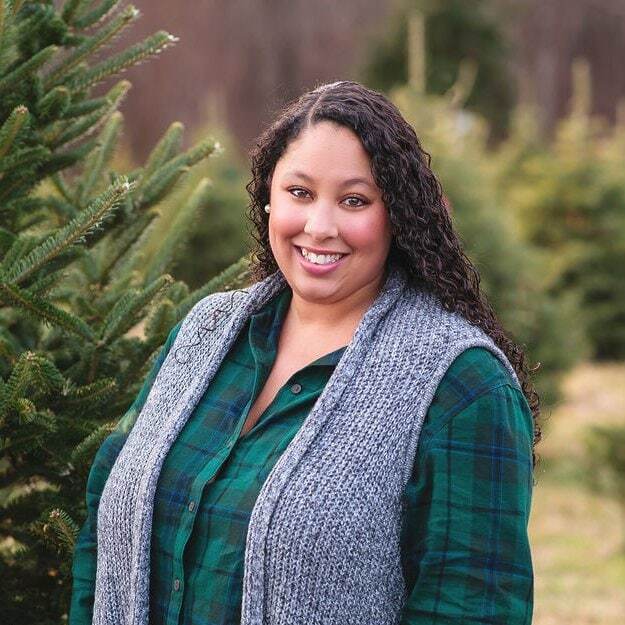 It is soft and cozy and compliments modern farmhouse look perfectly. Want to save this for later? 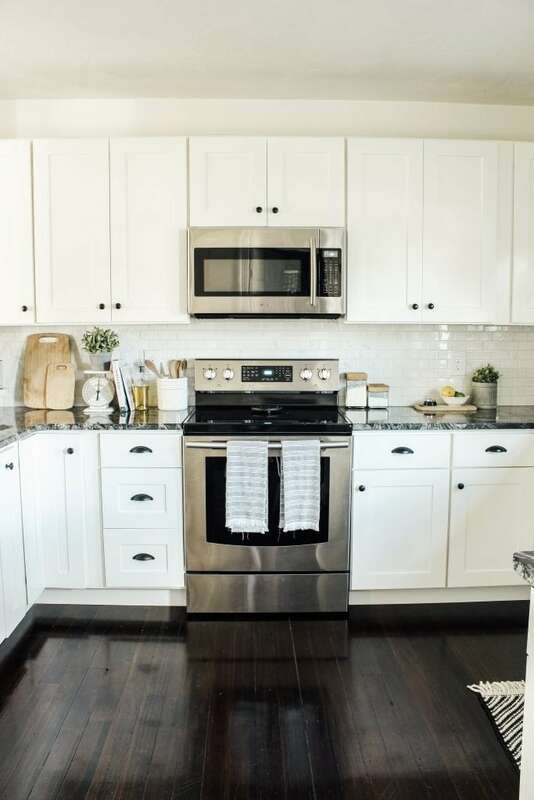 Post this Modern Farmhouse Kitchen Makeover Reveal to your favorite Pinterest Board! Love it all! Which size is your rug? Thank You! It is 2×3 but I would have gotten the 2’6 x 4 if it had been in stock.